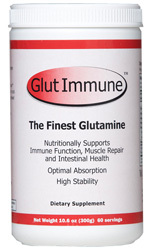 GlutImmune™, by WellWisdom LLC, is a natural source of Covalent Bonded Glutamine derived from red wheat berries. The Glutamine is connected to other amino acids on an oligopeptide chain or more specifically covalently bonded to other amino acids. Nutritionally supports muscle repair, intestinal health, immune and brain function. Highest absorption and stability. Delivers up to 10 times more pure glutamine to the bloodstream than L-glutamine. Glutamine functions as an important biosynthesis precursor in intestinal cells by supporting the synthesis of Glutathione. This product is 32% glutamine by weight. It is enzymatically derived from red wheat berries and contains 14% gluten. The majority of commercially available Glutamine sources offer only cheap glutamine supplements such as L-Glutamine, a synthetic, free amino acid. L-Glutamine has been shown to be unstable in the presence of heat, water, acid or base solutions, making L-Glutamine impractical to utilize in all but powdered food preparations. Covalent Bonded Glutamine, on the other hand, has been shown to withstand processing temperatures of 180 degrees Fahrenheit for one hour or 250 degrees Fahrenheit for 15 minutes and pH variances in the range of 3.5 to 9.0. In addition, Covalent Bonded Glutamine is stable in aqueous solutions for prolonged periods of time. Covalent Bonded Glutamine can be used in all liquid and semi-solid food preparations. In addition, due to the instability of L-Glutamine in water and pH extremes, it is safe to assume that a majority of L-Glutamine decomposes once it passes into the human gastrointestinal tract. Gastric acid is equivalent to 0.1 Normal Hydrochloric Acid (pH less than 2) and at 98.6 degrees Fahrenheit and a pH below 2, L-Glutamine decomposes very quickly. Since L-Glutamine is a free amino acid, any amount that does survive the pH extremes of the stomach is absorbed through the intestinal wall by a different mechanism than covalent bound amino acids…this free amino acid absorption mechanism is competitive… meaning that in an excess of free amino acids, only a percentage of any particular free amino acid will be absorbed. Covalent Bonded Glutamine, on the other hand demonstrates improved retention in intestinal cells, and oligopeptide chains containing Glutamine will be absorbed through the intestinal wall by a less “competitive” method. Studies by P.D. Fairclough et al., G.K. Grimble et al, and D.B.A. Silk et al, have shown that uptake of amino acids is faster and more “even” from oligopeptide chains than from the equivalent free amino acid mixtures in the human intestine. In other words, Covalent Bonded Glutamine will be absorbed faster and more efficiently than L-Glutamine in the human digestive system. Ingredients: (per serving) Proprietary covalent bonded glutamine - 32% glutamine by weight and is enzymatically derived from red wheat berries. Directions: Add one or more scoops to food or blend with any liquids, hot or cold. Consume 1 to 3 times daily (scoop enclosed in jar).